When Katherine of Aragon is brought to the Tudor court as a young bride, the oldest princess, Margaret, takes her measure. With one look, each knows the other for a rival, an ally, a pawn, destined - with Margaret's younger sister Mary - to a sisterhood unique in all the world. The three sisters will become the queens of England, Scotland and France. United by family loyalties and affections, the three queens find themselves set against each other. Katherine commands an army against Margaret and kills her husband James IV of Scotland. But Margaret's boy becomes heir to the Tudor throne when Katherine loses her son. Mary steals the widowed Margaret's proposed husband, but when Mary is widowed it is her secret marriage for love that is the envy of the others. 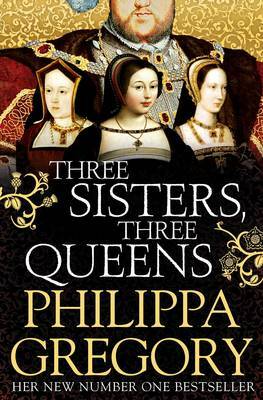 A master of period biographical fiction Philippa Gregory is one of the most popular novelists writing today. Her novels range across historical periods from the early 1400’s to the Twentieth Century but she is best known for her portrayals of the women around the Tudor court of Henry VIII, most famously Anne Boleyn in The Other Boleyn Girl.